Shiseido Ultimate Power Infusing Concentrate, .33 oz: Wowsers! The retail on this is SUPER high! Even on Amazon, a 1 oz bottle runs at $64.99! The smell is nice and I have used it once and liked it! This little sample retails for $21.45!!! Toni & Guy Sea Salt Texturizing Spray, 2.5 oz. : Amazon per ounce value $4.07. This is actually one of my favorite items from the box. I love Toni & Guy products, and the smell is AMAZING! I love how it made my hair feel! I so wish the bottle was a little smaller and 2 ounces, so I could easily bring it in a carry on when I travel, but this is a really nice bottle! Dr. Jart BB Beauty Balm, .20 ounces. This is one of my all time favorite beauty balms. I think it is the most effective one on the market today. The coverage is REALLY good, and it leaves your face looking amazing, so I am always happy to get more of them. I can actually get about 4-5 days worth of coverage from one little bottle. Amazon per ounce value $4.23. Total value: $34.57 which is an incredible value given I SPENT $10 total and got back a total of $15 in shop credits! In the end, I got 5 products (6, but 2 were a repeat of the same product). So, I went in and reviewed those 5 products and got 50 points. In the end, I spent $10 and got 150 points ($15 worth) of credits for the store! That is an AMAZING deal!!!! 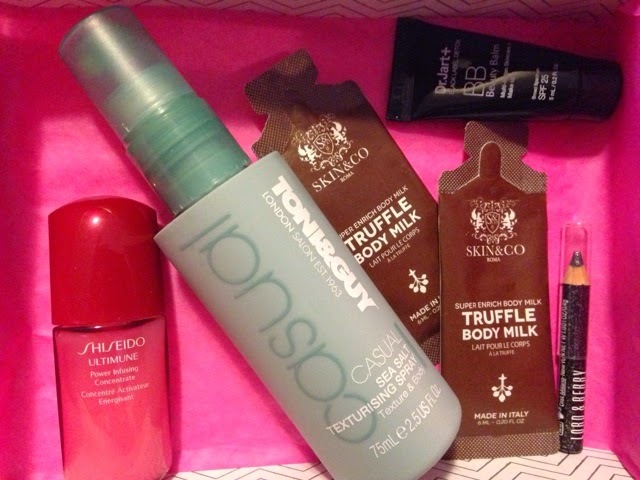 You can sign up for Birchbox for only $10 too. Make sure to use the coupon code and go back and review the products for $15 worth of store credit! This post contains referral links. Clicking through with the above links may result in a credit for MamaBreak. We only recommend products we love! We thank you for supporting MamaBreak!